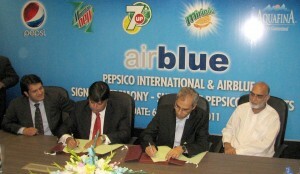 An exclusive agreement was recently signed between Pepsi and air blue, according to which PepsiCo will provide beverages for all air blue operations. A ceremony was hosted by CFO air blue “Junaid I Khan” at the air blue headquarters. Present on the occasion on behalf of air blue management were Mr. Junaid I Khan (CFO) , Ms. Sadia Mohammad ( Director Corp. Affairs), Mr. Aslam Chaudhary (Director), Ms. Rabiya Riaz (GM Marketing) and Mr. Saeed Malik (Manager Finance). Whereas PepsiCo International was represented by Mr. Jahanzeb Qayum Khan (Country Manger Afghanistan & Pakistan Beverages), Mr. Asghar Khan (CFO), Mr. Imran Anjum (Director Capability), Mr. Khurram Koraishy (Marketing Director), Mr. Omer Malik (Franchise Director), Mr. Mohammad Khosa (Head of Corp. Affairs), Mr. Adnan Abbasi (Key Account Manager) and Mr. Awais Amin (Key Account Executive) at the signing ceremony. Air blue is Pakistan’s second largest, fastest growing airline having state-of-the-art, young and modern fleet which is providing scheduled Domestic and International destinations. PepsiCo is a world leader in convenient food and beverage brands globally. This arrangement announces a strategic partnership with air blue where PepsiCo products will be exclusively served on air blue flights.